Our love-love relationship with Kiva continues. For the past few years, we’ve participated in Kiva’s microlending program, where we pool our money with other lenders from around the world — just regular people like us — to fund business loans for impoverished small business owners in developing countries. It’s been rewarding seeing our borrowers thrive in their businesses and using their loans to help lift themselves out of poverty. One of our borrowers who lives in Togo, restaurateur and father of four, Yao, recently paid off the loan he borrowed for his restaurant business. With our funds ready to reloan, we chose David (pictured below). 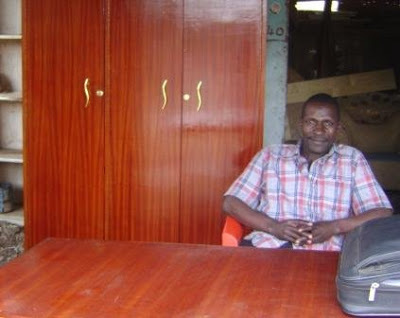 David makes custom furniture and has owned his own shop in Kenya for 18 years. His loan, funded by 28 lenders in the U.S., Australia, Japan and Belgium, will be used to buy timber for making more furniture, which will help his business to succeed, hopefully enough to allow him the funds for buying a vehicle for furniture delivery (one of his long term goals). David’s loan entry also happened to be one that Innkeeper Brigette edited in August as part of Kiva’s Editing Team, so we feel connected to David. Our best wishes to him for success in the future! This entry was posted in Uncategorized and tagged Kiva by Inn on Mill Creek. Bookmark the permalink.